China is working to develop a 33,069-ton nuclear icebreaker, which would be even bigger than the epic nuclear-powered vessels built by Russia. South China Morning Post reported that while the purpose of the ship has not been specified, the plan is to have a 152-metre long, 32-metre wide and with a displacement of 30,000 tonnes. China General Nuclear Power Group (CGN) has invited bids for the contract to build the vessel and it is described in the tender documents as an "experimental platform". The deadline for interested parties to tender was Wednesday (yesterday), with no bids permitted from outside mainland China. The specification is small for an aircraft carrier, but a military affairs expert said it would help develop China's shipbuilding ability. At present, its only nuclear-powered vessels are submarines. However, developing its own nuclear-powered ship as an icebreaker is bein seen as China's way of expanding its reach significantly in the Arctic Ocean. The ship will be able to be fitted with two 25 megawatt compact pressurised water reactors with thermal power output of 200MW, which could propel the ship to a maximum speed of 11.5 knots, according to CGN's project description. Russia is the only country that operates nuclear icebreakers. Its two classes in service are the Taymyr-class vessel - which is 150 metres long, 29 metres wide and has 21,100 tonnes of displacement - and the Arktika-class vessel, which measures 148 metres long by 30 metres wide, and comes in at 23,000 tonnes. 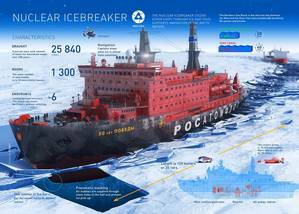 An even larger class of icebreakers - 173 metres by 34 metres with displacement of 33,540 tonnes - is under construction.